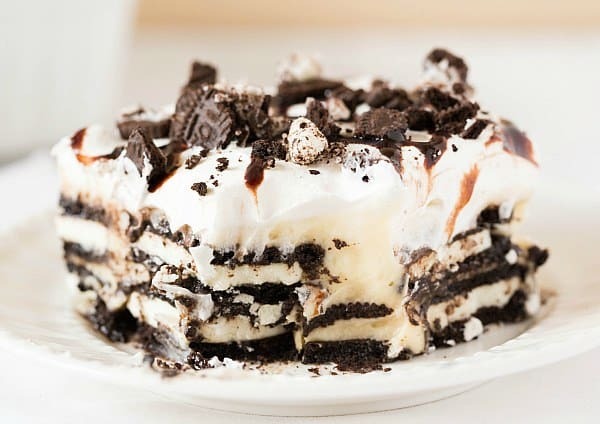 A few years ago, I shared with you my grandma’s super-simple recipe for what she always referred to as “icebox cake.” It was an easy dessert that graced her table on countless Sundays – two alternating layers of graham crackers and vanilla pudding, topped with crushed graham crackers. Sometimes she’d throw Cool Whip on top, sometimes not. It was familiar, refreshing and comforting. 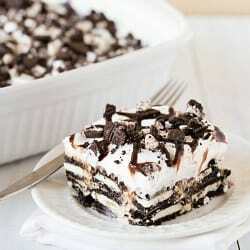 In the past year or so, I’ve been seeing a ton of icebox cake recipes pop up all over the internet. Most of them use chocolate wafers as the base and whipped cream in between layers. 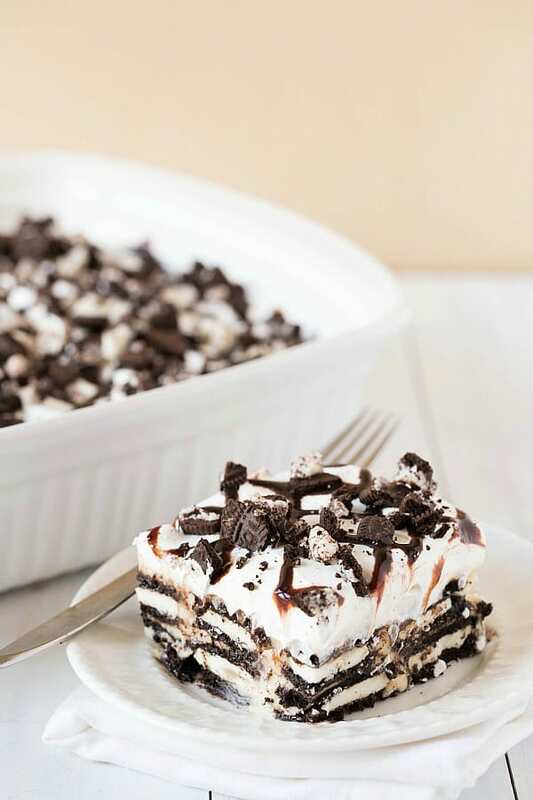 Recently, I saw an Oreo Icebox Cake over on Cookies & Cups that inspired me to slightly tweak my grandma’s recipe. Basically, instead of graham crackers I used Double Stuff Oreos and instead of vanilla pudding, I used cheesecake-flavored pudding. I threw a layer of Cool Whip on top for good measure, then drizzled it with chocolate sauce and chopped Oreos. Game, set, match. It isn’t exactly a secret that I have a love affair with Oreo cheesecakes, so anytime I can finagle a way to incorporate both Oreos and cheesecake flavor into a dessert, you better believe that I’m going all-in on that project. 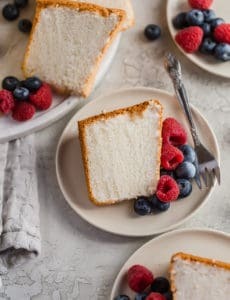 I love how incredibly easy and versatile icebox cakes are to make. Use whatever favorite graham crackers or cookies you have, your favorite pudding flavor, and you’ll have it assembled in less than 15 minutes. The hardest part is having to leave it in the fridge for a few hours to set up. If you’re desperate, you could always nibble on leftover Oreos to tide you over (not that I know anything about that). Oreos weren’t something that my grandma stocked her pantry with regularly (she was more of a Keebler and Chips Ahoy lady), but if she were here today, there’s no doubt in my mind that she’d gobble this up and ask for seconds… and then promptly skip dinner. That’s how she rolled. A woman after my own heart. 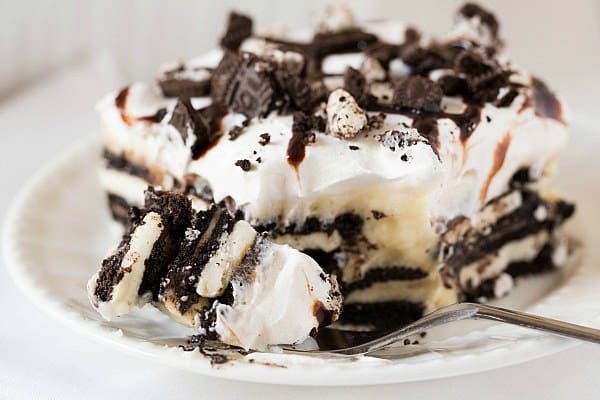 A riff on my grandma's famous icebox cake, using Oreo cookies instead of graham crackers and topping the whole thing with Cool Whip. Line the bottom of a 9x13-inch baking dish with Oreos, breaking them to fill in any big gaps along the edges. Whisk together 1 box of instant pudding with 2 cups of the milk for 5 minutes, or until the pudding thickens and appears set. Pour the pudding evenly over the layer of Oreos, using a rubber spatula to spread into an even layer. Top with another layer of Oreos, again breaking them into pieces if needed to fill any large gaps. Prepare the second box of pudding as you did the first, with the remaining 2 cups of milk. Pour the pudding over the 2nd layer of Oreos, spreading it into an even layer with a rubber spatula. Top with the Cool Whip, using a spatula to spread into an even layer. Refrigerate for at least 4 hours. Prior to serving, garnish the top with chocolate syrup and chopped Oreos. Would this hold up if I made it 3 days in advance? If so, should I freeze it and then thaw it in the fridge the night before? Hi Sherry, I would probably make it no more than 2 days in advance, as the cookies could get pretty mushy. I don’t know how well it would freeze, I’ve never tried it. Yummy! Made this the other night for another couple (and us!) and it was delicious. We all loved it and it is already gone today, thanks! Also, can I use Jell-o NoBake Cheesecake Dessert? I did find the cheesecake flavored pudding. *Would* this work with real whipped cream instead of Cool Whip? Alice, You would have to serve it immediately and not plan on having leftovers. Real whipped cream, while delicious, isn’t stabilized like Cool Whip, so it will start to weep after awhile. I made this over the weekend too (in addition to the Key Lime Bars) and this was a another huge hit. People went nuts over it. And it is incredibly easy…. which I love. Fabulously refreshing & perfect for summer parties. EASY enough for the Kids to help, or to make for Father’s Day, etc. Love this Michelle… Grammy rocks! This looks amazing. However, going to the grocery store I looked for cheesecake flavored pudding mix and apparently I went to the wrong store because I didn’t find any but I decided to use white chocolate pudding hopefully it will still taste amazing. This looks beyooonnd divinne!! But im worried about the cool whip since we donthave that where i live! Could i replace with homemade whipped cream?and how many cups? And can i replace vanilla pudding instead of cheesecake flavor?thank you!! Or even oreo pudding mix? Hi Christine, You can replace with whipped cream (I would whip 2 cups of cream for the topping). You can also replace the pudding with vanilla if you’d like. Wow this looks so amazing, can’t wait to try this.. This looks like pure creamy heaven!! I seriously couldn’t stop eating this after dinner last night. This is probably one of my favorite desserts of yours now. Gram would be proud ;-) Love you! Oh, but the pictures on this post made me drool. 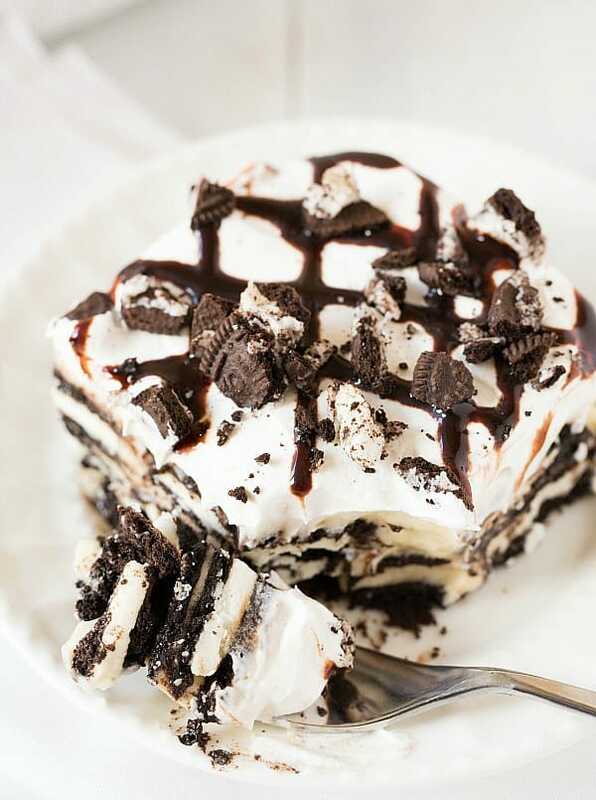 I gotta have this icebox cake. Thanks for sharing the recipe! What a lovely idea? I love that graham crackers are so versatile and lend themselves to so many recipes . 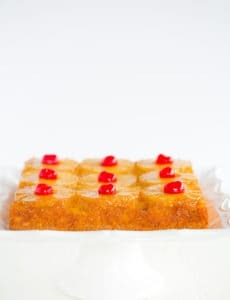 I have been seeing so many icebox recipes but some how one passsed down from grandmas are always more delicious! I think this looks awesome and I honestly have no problem with prepackaged food, but I am staunchly anti-Cool Whip. I think it’s totally nasty. (My opinion–my hangup is the taste and no high-minded anti-processed food reasoning.) If I were to make this, could I use just heavy whipping cream? Or would you suggest something else? Thanks!!! Hi Steph, If you make your own whipped cream, I’d be sure to make stabilized whipped cream so that it doesn’t weep. Wow, girl – this looks *amazing*!!!! How many oreo cookies?? Do you really use 3 full packages? I don’t usually see them in boxes. 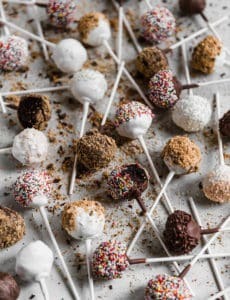 Help I want to make this for teacher friends tomorrow! Hi Diana, I didn’t count them, but after looking online, it says there are 36 cookies per package, so I probably used about 75-80 cookies (I chopped 6 cookies for the top garnish). Holy crap! I can’t make this, I’ll eat the entire thing! Looks amazing. This recipe looks great!! And insanely easy to make a vegan version, which is hard to find on your site with all the cheese, cream, and bacon. Thank you!!! How do you make the vegan version? Oh, these look absolutely delicious! I’ve never tried making an icebox before. Now I will have to! This looks yummy and want to try it soon. Just a little confused, you state there is only 2 layers of oreos but there appears to be 3 in the picture. Please clarify. Hi Karen, It might be an optical illusion (?) but there are only 2 layers of Oreos in the recipe. I made it as written above.